Innocent IX, born Giovanni Antonio Fachinetti or Facchinetti in 1519. He filled the offices of apostolic vicar of Avignon, legate at the council of Trent, nuncio to Venice, and president of the Inquisition. 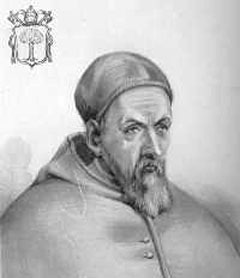 He became cardinal in 1583; and under the invalid Pope Gregory XIV assumed almost the entire conduct of affairs. His election to the papacy, on the 29th of October 1591, was brought about by Philip II, who profited little by it, however, inasmuch as Innocent soon succumbed to age and feebleness, dying on the 30th of December 1591.